Do te own any Scooby-Doo video games? At the end of the opening credits it shows Scooby Doo coming out of a storm drain o sewer pulling off a mask and holding it. What episode is that from??? What is your preferito monster from the scooby-doo franchise? Can anyone point me to an episode of Scooby Doo that uses the door gag? te know, where the gang is being chased da a monster and they keep running in and out of doors in the same hallway? What do te like most about Scooby-Doo? 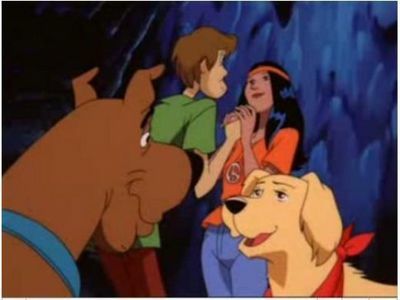 The Dynamic Scooby-Doo Affair has Scooby-Doo and his Friends meeting Batman and Robin. They try to stop a crime involving a mysterious and new villain who has a money scheme. The episode also the Joker and pinguino who cause the Heroes trouble in their Fun House. Scooby-Doo Where Are You? is a classic Hanna-Barbera animated show. The mostra is 1 of Hanna-Barbera's most popolare shows. The mostra is about 4 humans (Fred, Shaggy, Velma, and Daphne) and a dog (Scooby-Doo) who are mystery solvers. In each episode they go up against a different antagonist. The fact that each episode has a different antagonist helps keep the mostra unique. The adventures of the main characters are entertaining and fun. Scooby-Doo is a long running franchise about a dog and his human Friends defeating villains with their mystery solving skills. This lista is my ranking of the members of the team. This lista includes the original members as well as the members that joined later on. This lista is dedicated to Bill Hanna, Joe Barbera, Don Messick, and Casey Kasem. I haven't done much posting here on fanpop lately, however I wanted to take the time to post an opinion piece that involves a subject that I know well(at least one that I've known well since the mid 1990s o so). This subject is Scooby Doo; as you're probably aware of, Scooby Doo is an animated Televisione series about four teenagers and a talking Great Dane who solve ghostly mysteries. The first Scooby Doo Televisione series(known as Scooby Doo Where Are You?) aired on CBS beginning on September 13th, 1969 on Saturday mornings. He went to get his daughter’s wheelchair that had been parked outside of her rosa and purple fiore bedroom. When he arrived into the bedroom with her wheelchair, he found Fredricka already awake. Hi, everyone! I would like to ask a quick domanda before I post. Does anyone here like the idea of the successivo generation? I thought I'd give it a shot here in this club and see what te all think. Enjoy! a comment was made to the poll: Who's your preferito Fred actor? a comment was made to the poll: Who's your preferito Scooby-Doo actor?